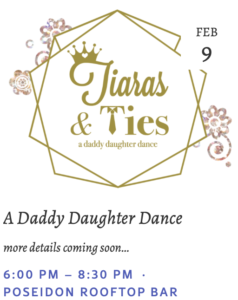 Tiaras and Ties, A Daddy Daughter Dance at the Poseidon Rooftop, Saturday, February 9 from 6-8:30 p.m. Event is sponsored by the Island Rec Center. 843- 681-7273 or events.islandreccenter.org.